The first night of the convention went swimmingly. 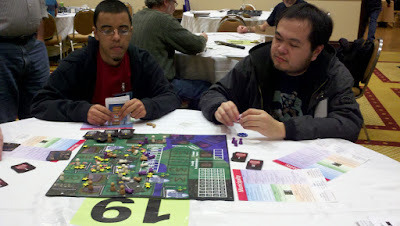 Normally, when I run playtest sessions at the Jersey conventions, I have to just set up the game and hope enough people who aren't pre-registered for another game during that time slot find the prototype attractive enough to give it a try. This time, when I checked the big board, I saw that all four slots were filled up with pre-registered players. There was even another person penciled in the alternate slot. When I run playtests at home, I almost never get to test with the full number of players because usually one or two people will drop out on the day of the test. To have a guaranteed full complement of players was a pleasant surprise. The Municipality test itself went well. It took two hours, while the typical game is only 90 minutes. This was because of a combination of AP and the players not recognizing the inflection point where they had to race to campaign. The Tax Assessor and Deputy Mayor roles were far more popular than they have been in any previous test. The players were strongly positive on the game. Their main complaint centered around the randomness of which land spaces became available for purchase, but one of them suggested a clever fix, a variation of which I will implement for the next Municipality test on Sunday. Towards the end of the test, a couple of people asked me to stop by when it was complete. It turned out that they are from a publisher and, based on the reactions of the people in the test, wanted me to show them the game separately. I gave them my elevator pitch for the game and one remarked, "I love when games do that," referring to the passing of Political Capital back and forth between the players. We scheduled a time for a real run through the next day. Finally, I arrived (late) for a session of Dan Cassar's new game. It is an early-stage prototype and I think the group as a whole gave him good feedback. Afterwards, Dan and I headed to the hotel bar to talk shop for awhile. We discussed design philosophy, other designers, strategies for dealing with publishers, and how to market your games. A strong playtest, an idea of what to change for the next one, and being approached by a publisher: not a bad way to start a convention.